This entry was posted in bike reviews, Choosing a motorcycle, Motorcycles and tagged T-100, Triumph Bonneville, Triumph Review. Bookmark the permalink. You and all the Bowl game people (as well as us locals) were a wee bit surprised by the Big Chill. Over the New Years Holiday weekend it got much worse (20 degrees at our house near Deer Valley Airport) so I think you caught the only warm weather we’ve had in a couple weeks. How does this bike compare to the V7 you bought? I test road one and I’m simply too tall for it. Love the look of the V-7 – so much like my old and beloved R65, but I’m too damned long in the inseam for it. Yet, I want a roadster. Looking forward to your further comments and impressions of the Bonne. You’ll note (if you happen to check out “The Church of the Open Road”) that I espied one at a recent winter tour of local motorcycle shops. Looked sweet, but clearly was no V-7. They must have improved the seat, as my departed 06 Bonneville the seat was as hard as an ironing board and I had to go to a Corbin. My big problem with the new Triumph’s is that they are now Thia-rumphs, and If I am purchasing a English bike I would like it put together in England. That is what pushed me over to the MG V7C and I could not be happier. To me the V7C is lighter, and handles much better than my 06 Bonnie, and handles the twisties of North Carolina much better than the Bonnie. Nice write up Dan – I considered a new Bonnie before I bought my Breva750 in 2004 but for me there was something about the Guzzi engine that was just special – and I felt it in the first 10 minutes of the test ride. Not to say I wouldn’t like a Bonnie as well, but to me the W650 (and probably the 800) out Triumph the Triumph. They are more “cobby”, if that makes the slightest bit of sense!. I’m impressed with the retro look of the Triumphs and LOVE the look of the W650, and wondered if Dan or anyone else would mention it. W800? I wasn’t aware there was such a thing, and since most reviews of the 650 mention a lack of power that would be a logical step to take on Kaw’s part. I’m also waiting to hear Dan’s comparison to the V7. Don’t think I’m going to do a comparison with my V7. I’ll lay out the case for both bikes. It’s a matter of what bike speaks to you more than anything else. I had a wonderful time on the Bonnie, and the next article will spell out what a day trip in the twisties are like. The 2005 Bonneville black I had would have me wanting to get off after 1/2 an hour, the seat was not much better then a plank. 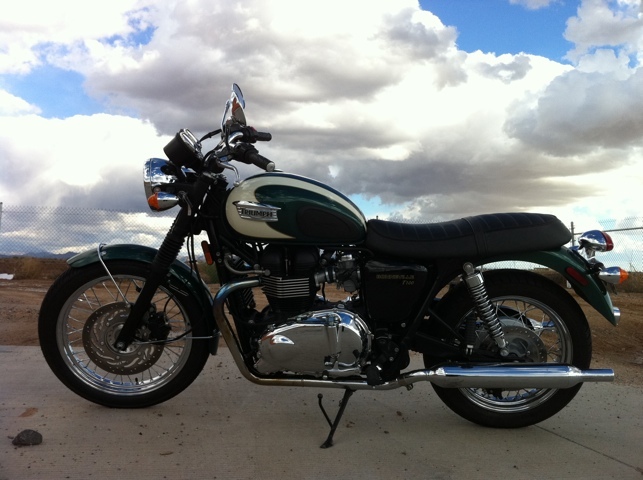 I like the old ones better, the 1979 Bonneville is a fine bike, lighter, more power, better handling, and more comfortable. The ones I had were very reliable, even during 9000 mile trips, around the US. 9000 miles in 3.5 weeks, its got to be comfortable! Last time I was in the dealers, I noticed they have a few different style flat seats now, when I had mine, it was stock or the solo seat, that was it. The motor seems big and heavy, but ran fine, no issues with my bike. Much heavier bike then the old ones, you would think modern would be better…. I may have to rethink the V7 classic, you seem to be comfortable on any bike you ride, and I thought the Guzzi would be just the ticket for comfort based on your review…! @Bill Maier The new Triumph Bonnevilles are made in England, not Thai(land) or anywhere else in Asia. People are more credible when they have facts right. I have my facts straight. Since the middle of 07 all twins have been assembled in Thailand. All vin numbers prior to 07 the eleventh character was a J which is the place of manufacture England. After the middle of 07 up to the present time the eleventh character is a T which shows it was manufactured in Thailand. The parent company will tell you that they are assembled in Thailand. I have a 2010 Bonnie Jet Black T-100. This bike is very forgiving. Handles and brakes well. As for the Thai connection. The 865 engine is made in Hinckley. The bike is assembled in Thailand. I wanted a new Bonnie. Not used! If you can find me a motorcycle,car,truck that is 100% American or British in 2010 let me know. I guarantee the parts on them are from Japan,China,Mexico,Canada, etc. The Heart in my Bonnie was made in bloody”ole” England! I’m a big admirer of the engineering standards. Where it’s assembled means much less than how it was designed! The 2007 stock Bonneville seat was cheap and hard so I put on this one from Burton’s bike bits http://www.burtonbikebits.net/images/CIMG1918.jpg. It is comfortable for all day rides. 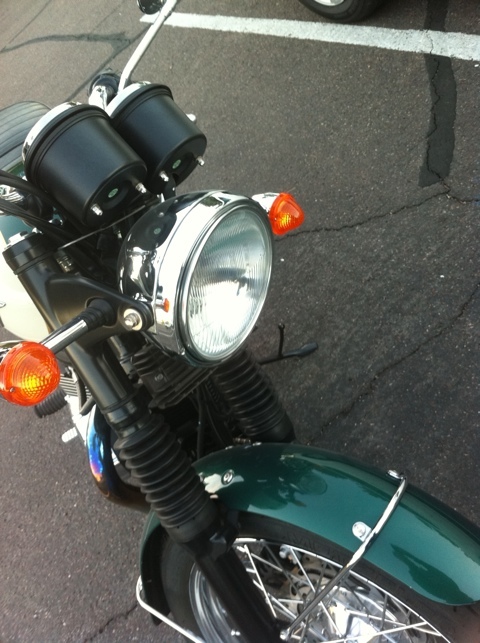 I added a grab rail and it looks much more like a late 60s real Triumph, I suppose. The stock handlebar is too wide, too high and too far back. I got a set of Omar’s and they are practically infinitely adjustable. http://www.rearsets.info/handlebars.html. I have much more steering control and balance countersteering in the turns. Plus I lean forward just a titch and that is sooo comfortable all day in the wind. I swapped out the headlight for a Cibie with 100 watts. Wow. Daylight at night. I put on an electrical connection and wear a heated riding suit in cold weather. It gets toasty hot. Even the gloves. 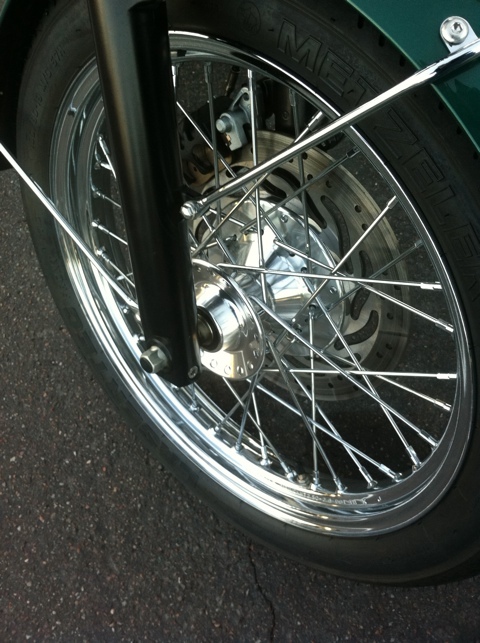 I have tuned the bike up with Staintune cans and richened the jetting. It added a couple horsepower. A complete re-jetting and Airbox mods will turn the bike into a truly powerful twin compared to stock. Apparently there is a huge performance gain from these changes for very little money and trouble. That is next. I have lots of bikes. Many cost three times more than the turnip. But I think it is possibly the BEST all round roadbike I have ever owned. If you count the smile it puts on my face. It is definitely not the fastest or the most sophisticated. But that is part of what makes it so damn charming. Thanks for all the info Dan. I’m getting either a thruxton, bonnie, or v7 cafe in the next few weeks, and I’m having a hard time deciding. I love the classics, and love long distances and living off the bike (with full luggage), so it’ll have to serve double duty in brooklyn/manhattan streets, plus long trips during the off months. I used to have an r60/5 and could ride that beautiful machine all day and into the night … looking for a bike that gives me that same feel balanced forward against the wind, yet super stable in the cross/truckwash turbulence. I like the beefier weight of the triumphs (more like my airhead), plus my beemer had low cafe bars and I’d usually keep my feet back with toes on the pegs for comfort, so I’m less worried about the thruxton geometry – but I’ve heard it’s way too agressive for long-distance comfort, and that it – and the bonnie – aren’t as stable feeling at speed as the guzzi. true? Any advice would be great since you have experience with all of them. And regardless of what I get, I’ll be stopping in the area in July to see family in Troy (where I grew up) on my way out on the first trip. We’ll have to get a ride in while I’m there. I had a Ducati ST2 that I toured with for a bit, and the forward-ness on those bars didn’t limit me, but did have me sore as hell after a 6 hour stint, looking for the Advil. The Guzzi’s position is very nice, the cafe more aggressive — I split the difference with some Norman Hyde “M” bars on my classic now. Depends on what you like. The Bonnie’s gonna have a little more top end, a little more maintenance with the chain and adjustments. The V7 is a little slower, but low maintenance and much lower in the gravity department. The V7 “bags up” nice — I can’t speak to the Bonnie in this regard since I just used a backpack – I pack very light. Try them all. The “right” bike will speak to you. Don’t disregard the Scrambler or the Duc 1000GT (I haven’t been on either much). Scrambler owners swear by them. Bonnevilles a great bike. I’m on mine all the time and the bike now has 20,000mls. Runs perfectly and handles well. Awaiting my airbox removal kit to arrive. Apparently makes a huge difference in mid range torque. Pretty good already so I’ll look forward to the improvement! Triumph which was made in Coventry or Meriden entirely. there goal is to make the bike 100% British made. for a Bentley if it was “assembled” in India or Thailand? 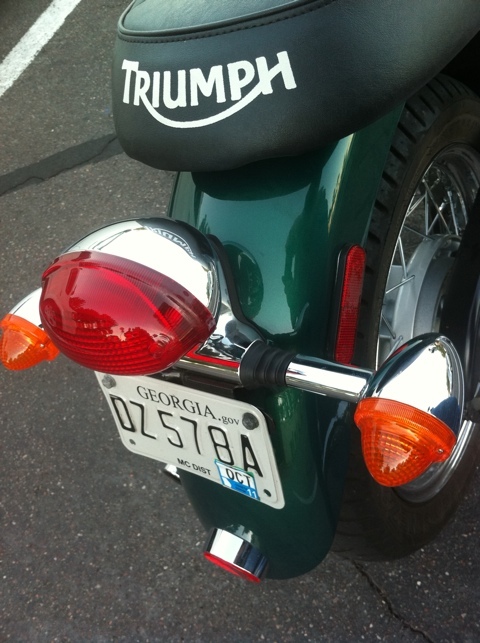 “Triumph” is nothing like a REAL BRITISH made Triumph. I will buy a Norton because it’s a true British bike. Well, many triumphs are still built in the UK, including the Thunderbird. By the way, Bentley is owned by Audi/VW, Rolls Royce by BMW, and who knows who owns Jag and Aston? Minis are built in Brazil. It’s a big world. Lots of good hands building bikes now. The Bonneville is a Quality Bike, even if it were built by Lapps in a tent while birthing Reindeer. ‘assembled” in any third world country, China, thailand, malaysia, etc. of those issues associated with the thai assembled bikes. That whole designed in USa but assembled in china is a joke. China and INdonesia manufacture/assemble inferior products. Danilo, when will you give us an update on your V7 Classic. I would be pleased to hear your thoughts after many miles with this baby. What do you think of the 2012 model upgrades, and have you had a chance to sample the goods? iPhones? Other smartphones? Just about everything you can buy at WalMart? What about all the components of a car that are assembled in Thailand especially? China is hardly a third-world country, with a huge economy, more people than anywhere else and enough money to have a large position in our overall debt. A “slave wage” in a third-world country isn’t the same as what you might think. Kenya’s average national income is less than $400 a month — Would $1000 a month there be a living wage? Is it a living wage in Cincinnati? We were most definitely a “third world” country at the beginning of the Industrial Revolution, and really didn’t come to the forefront as a world power until at least in the early 1900s when TR sent the “Great White Fleet” around the world. Were goods built in the USA before that inferior? The countries in Southeast Asia have excellent education, the newest and most automated foundries in the world, and they build the Triumph to spec. If it has plastic pieces now where metal once was you can’t blame the assemblers, you need to question why these parts were specified by the Product Managers and Engineers. That’s like blaming the waiter for cooking a lousy meal at a restaurant. Well tempered response, Danilo. You nailed it gracefully. Thanks. Ride safe.